PVC Roofing is a great choice for commercial enterprises because of its resistance to corrosive damage. Commercial business owners looking for a great new roof with chemical resistance and exceptional impact resistance need PVC roofing in Dallas, TX. The hot, long summers of Texas make roofing options like PVC an excellent way to save money and energy. High volume businesses that worry about chemical waste destroying their rooftops can rest assured knowing PVC roofing won’t let you down. Have a Legends Roofing contractor install PVC roofing for your next roofing replacement or as the roof of your brand new business. Call us today to set up an appointment for a PVC roof replacement or installation at [nw_data field=phone]. Because of its great defense against chemical deposits, owners of factories, restaurants, and industrial structures, will save on repairs with PVC roofing. Not only is it impervious and weather proof, it’s almost indestructible to chemical elements found in oils and grease. Polyvinyl Chloride has a natural resistance to heavy fats, oils, salts and many chemicals that easily damage other roofing materials. With such a high resistance to normally corrosive elements, factories and restaurants find the roofing type to be a great problem solver. As one of the most popular “cool” roofing options, PVC roofing is a perfect solution to finding a roof that can withstand the demands of your business, take on Texas storms, and save energy as well. With professional installation, PVC roofing is impact resistant even in hail storms or high winds. PVC roofing, light or white in color, is extremely reflective and UV ray resistant, making it practically unbeatable when it comes to saving energy. 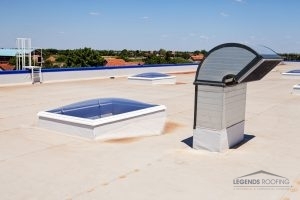 Business owners can rejoice with lower energy bills knowing their roof is helping to regulate indoor temperatures while resisting heat, harmful rays, and precipitation from the outdoors. All of these great benefits make it easy for PVC Roofing to last business owners a good 20 years. With consistent resistance to hail, fire, and chemicals, restaurants and other high volume business can benefit from this durable roofing option. For the best results, always contact Legends Roofing for professional installation, replacement, and repairs. Business owners are encouraged to schedule regular maintenance with their local roofing contractor. For an estimate, call Legend Roofing today at 214-321-3293. We look forward to setting up an appointment for PVC roofing in Dallas, TX with you. Updated on August 4, 2017 at 1:43 pm by Legends Roofing.